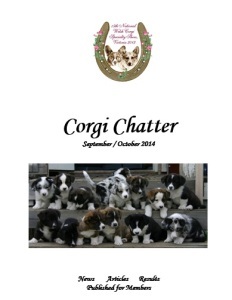 The Corgi Chatter is the Welsh Corgi Club of Victoria’s bi-monthly newsletter, and the September-October edition has just been emailed out now. If you are a current member you can receive it by email in glorious technicolor as a PDF document. The email edition gets sent as soon as we send the file off to the printers, so you get it earlier and in colour!